Bridget focuses on the management and development of our investment practice in addition to her tax planning and preparation services. 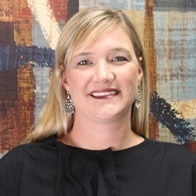 Bridget holds a business management degree from the College of Saint Benedict and has an extensive financial management background having worked as an internal wholesaler for American Funds Group as well as both TD Ameritrade and Oppenheimer Funds. Bridget holds numerous securities and insurance licenses. She is a member of the National Association of Tax Professionals and is authorized to practice before the IRS as an Enrolled Agent. Bridget enjoys spending time with her three kids and traveling during the summer months.